Warning: This post could be regarded as too graphic or providing way more information than you ever expected. However, I feel the transparency is necessary to the story. Last summer, I should’ve celebrated my one year anniversary with my boyfriend all weekend long. We had plans to visit the restaurant where we had our first date on Friday and would visit a cute intown Italian restaurant on Saturday. That didn’t happen. Saturday, I was doubled over on my bed, cramping and bleeding profusely. Icy Hot and my heating pad only temporarily soothed the pain, but it was uncontrollable. Nauseousness lingered as I tried to stay present enough to figure out my dinner outfit. I was being optimistic because honestly, I knew dinner wasn’t going to happen. That Open Table reservation was getting canceled, despite the restaurant’s confirmation call earlier in the week. I told him I was sorry but I didn’t see how I could successfully manage through a dinner in my state. Being the charming and understanding guy he is, he drove up to my house and we watched bad Netflix movies instead. I didn’t know at the time that my anniversary weekend was wrecked due to fibroids. I just knew that in months to come, I was unable to do anything I had scheduled within those first two days of my cycle. A follow-up reservation to the same restaurant was canceled again due to the symptoms. In the sitcom of my life, this was a recurring character I couldn’t stand. It wasn’t until months later that I was diagnosed. Everything made sense. I learned that I have two fibroids: one the size of an Oreo and another larger than a lime. That lime fibroid is located in my uterine muscle, which caused and continues to cause lower back and abdominal pain. I did the one thing everyone does once they’re diagnosed with anything: Google. I learned that fibroids can cause infertility issues. I learned that fibroids have no true root cause. And I learned that fibroids are extremely common among African American women. Sharing my diagnosis with a few close family members and friends opened up this secret gate that I never knew existed. I found that many women around me also had or currently have fibroids. Most of these women elected to have surgery to remove them, which was something my gynecologist said would need to happen eventually. I marveled in the fact that this wasn’t widely spoken about, but was a health concern many shared. A sisterhood within uterine health, if you will. My Google searches were also around preventive measures. If I could prolong or completely avoid surgery by all means, the better. I found many articles that discussed how embracing raw foods and more vegan/vegetarian diets could moderate fibroid pain and growth. I wasn’t 100% convinced. Holistic measures were always deemed as lesser to me, as I found in the past that traditional (man-made) medicines quickly did the trick. So I continued to go about life as normal. I scheduled my follow-up appointment where my doctor and I would monitor how quickly they were growing and next steps. And subconsciously over many months, I started doing the one thing I minimized: I began to embrace the plant-based lifestyle. I listened to my body more and responded appropriately. I realized within the last 9 months or so that my body doesn’t respond well to dairy. As an ice cream lover, I’d cramp for days after eating one or two scoops. I’d regret eating cheeseburgers within an hour. Eating red meat made me feel heavy. Eventually, I stopped indulging in foods that made me feel sluggish and inflamed. In changing the way I eat, I realized that my fibroid pains began to diminish in frequency and pain level as well. Through my new food journey, I found more alternatives to the foods I once loved. The world has evolved beyond black bean burgers and veggie plates (though, not that much but that’s a convo for another day). I was introduced to So Delicious and other delicious dairy-free desserts. I found vegan and vegetarian restaurants near my job that made lunchtime enjoyable. I bought the majority of my groceries from Earth Fare, Sprouts or Kroger’s natural and organic section and maintained. I could live with practically meat- and dairy-free, if I wanted. This exploration into a greener diet introduced me to the phrase “flexitarian.” Essentially, flexitarians are people that embrace more plant-based diets while occasionally enjoying (red) meat, fish, and/or dairy. 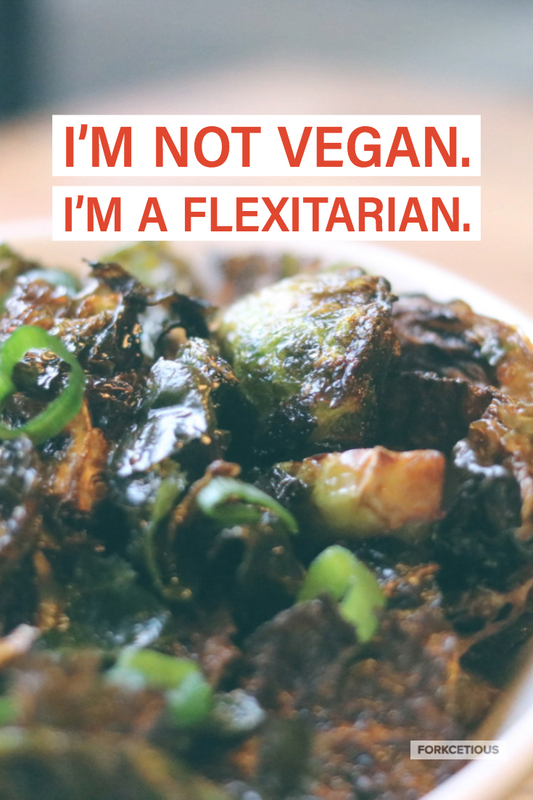 The “flex-” allows for the wiggle room whereas vegans, vegetarians, and pescatarians maintain stricter diets. This phrase helps me explain my eating habits as others need a box to place me in. So long story short, I learned I have fibroids which gives me great abdominal pain and that pushed me towards a more plant-based lifestyle. As I continue to manage my health through food and life, I’ll share the recipes, restaurants, food choices, and more on the blog.